Even with the advent of cloud-based streaming, there will always be the demand for the best gaming PC money can afford. For best-in-class fighting games like Dragon Ball FighterZ and online shooters that require a fast and fluid frame rate and zero latency, nothing compares to the experience of playing games natively using the components of your choice. Whether you prefer the sheer horsepower of an Nvidia graphics card or the value of AMD, the vast majority of PC makers give you the option these days. 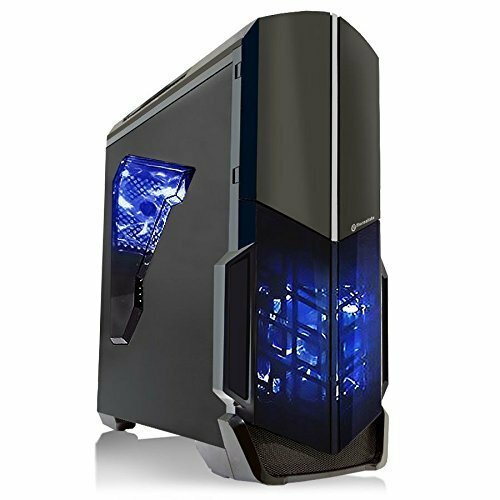 The CYBERPOWERPC Gamer Xtreme GXIVR8020A4 is loaded with the latest components including an AMD RX 580 graphics and a Kaby Lake Core i5-7400 processor that enable it deliver solid performance on both play and productivity. The package is nicely done, has the signature looks of a gaming PC and useful port options. As Nvidia’s Pascal graphics architecture spin into budget systems, AMD have countered with the latest Ryzen CPUs: Both are now changing how much performance we’re getting for decreasing amounts of money. Recently, AMD released the RX 580 graphics card, and the first system that the RX with Intel’s Kaby lake processor is the CYBERPOWERPC Gamer Xtreme GXIVR8020A4, a VR-Ready gaming desktop that, when it comes to processing tasks, which can also hold its own against desktops that cost more. If your wallet can stretch a bit, it’s possible to find a better gaming rig. But if all you want is a capable system for work and play for much less, it won’t be easy to find something better than this. The reasonable price of the Gamer GXIVR8020A4 does work in its favor on aesthetics. Like most boutique builders, CyberpowerPC occasionally goes overboard on the bling, and it’s something perfected on this system. 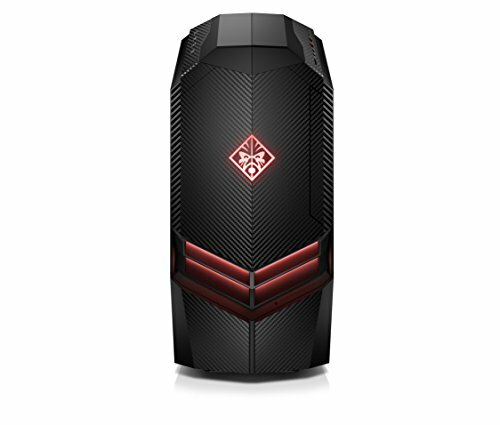 The iBUYPOWER Ultra AM900Z is a gaming PC that has a fairly unique styling, is expandable and fuses gaming and processing prowess at a delectable price. It is powerful enough to play most modern titles at good resolutions for much less than competitors. The iBUYPOWER Ultra AM900Z has the flair of a powerful gaming desktop and, there’s one unique feature that helps it stand out. 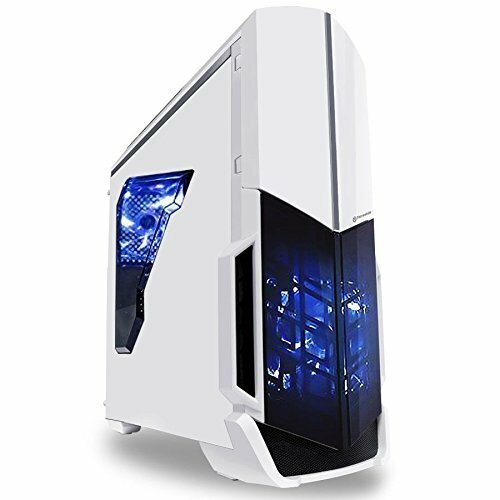 Its stablemate, the iBuyPower Snowblind Pro has a semi-translucent LCD on the left side panel, which displays images, videos and animations as you play. Now, iBuyPower flaunts tempered glass on one side panel, unlike the usual transparent glass we usually see on a single side panel, and, sometimes on the top panel. While it doesn’t provide lots of utility, it’s a worthy entertaining inclusion that doesn’t add too much to the system’s price. 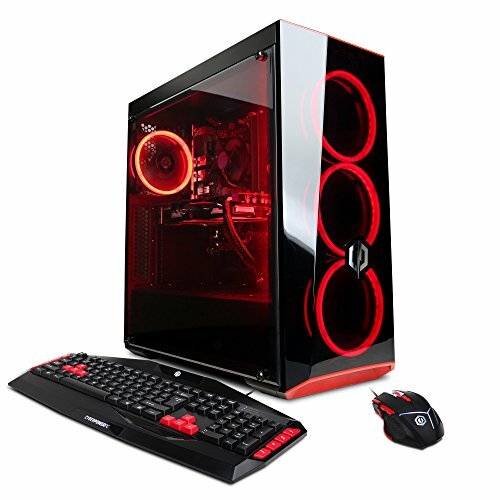 The system’s unique design, reasonable pricing, and solid gaming performance make the iBuyPower Ultra an entirely viable choice for you next boutique-built gaming PC. The case used for the Ultra AM900Z’s tower packs lots of bling. The black tower has a steel frame and glass flourishes, including a straight fin cutting from the front-upper left, a slight intersection with a bald black curve near the top, then straight to the lower-left side. The SkyTech ArchAngel (ST-ARCH-GTX1050TI-V1) isn’t pricey, but there’s no question, you’re getting a well-designed, speedy gaming system for your buck. It doesn’t stack up to more expensive gaming systems, but it’s still among the best in its class. How much luxury are you willing to pay for in an ultra-gaming PC? Often the main consideration when purchasing a boutique-built rig that’s incredibly affordable like the Skytech ST-ARCH-GTX1050TI-V1. But super polished and powerful as its top-tier competitors. Priced to make DIY gaming desktops sound scandalous, the Archangel is sweetly configured with the Pascal-based Nvidia GTX 1050 Ti graphics card, a 3.5 GHz AMD FX-6300 processor, useful ports and enough storage. It isn’t much of a stunner as our Editors’ Choice, the CYBERPOWERPC Gamer GXiVR8060A, in terms of aesthetics and performance, but it’s a shoo-in for anyone with a not so-gigantic, and offers better DIY options. The Sci-Fi inspired design of the ST-ARCH-GTX1050TI-V1 is, without a doubt, its raison d’être, and it’s very easy on the eyes. It screams gamer, but its near-rectangular chassis is white, with a pair of tapering lazy-black covers through which angel eye LEDs breathe light to the exterior, and beneath them is a black vent. The CyberpowerPC Gamer Ultra GUA3400A is a budget gaming desktop, that brings into the competition a great design and solid performance, for much less. It leverages best-in-class performance thanks to a six-core AMD FX-6300 processor a discrete 2GB AMD R7 250 graphics card. How do you tell apart a gaming desktop from a regular PC? No need to gamble! Normally, you’d point to a hefty built, ‘Sci-Fi’ inspired aesthetics, a splash of RGB lighting, and a red-and-black motif. 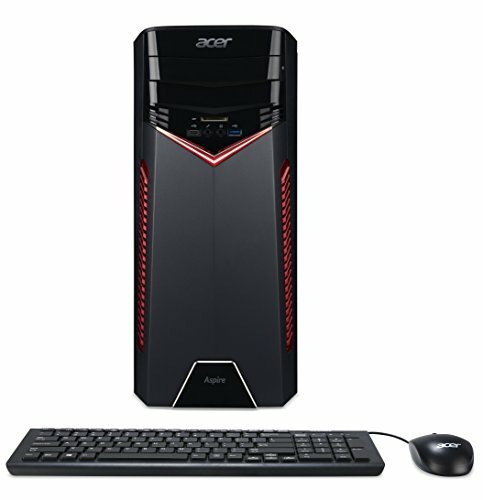 So, you won’t be lost in recognizing the CyberpowerPC Gamer Ultra GUA3400A as a gaming PC right away. 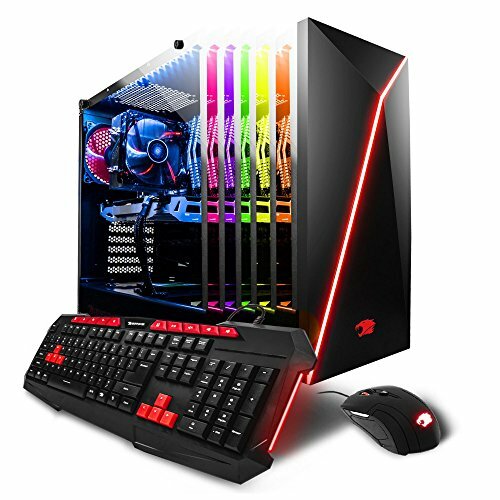 Its design notwithstanding, this most recent update to Cyberpower’s desktop gaming line packs a six-core AMD FX-6300 processor a discrete 2GB AMD R7 250 graphics card, which translates to a computer that’s fine for entry-level gaming, and can be had for a very good price. It isn’t the most powerful system around, but it will suffice for anyone on a budget but in need of a capable gaming rig. Plus, its ample mix of features, performance, upgradability and future-proofing specs represents a good value for the power it offers. The Ultra GUA3400A’s case measures a spacious 18.9 by 7.6 by 18.6 inches (HWD), which is fairly sufficient for the power packed inside. If you desire the strongest, most adaptable PC with plenty of room for upgrading, your best bet is just building your own. The past decade has seen a surge of knowledge and confidence to users across the board and now DIY desktops are becoming the norm. But let’s face it, not everyone is capable of building their own desktop PC, right? While tailor picking individual components and weighing their limitations is an advantage PC builders enjoy, not everyone has that understanding. So if you can’t have the comfort, control or satisfaction that building your own rig gives, your next best bet might just be finding consolation in buying a prebuilt one. The SkyTech Shadow (ST-SHADOW-GTX1050TI-V1) Gaming PC is a great prebuilt desktop to first check out. SkyTech have been in the prebuilding game for a while now and have gotten really great at it. Check out this desktop review to understand. Built into a black polished case, the SkyTech Shadow GTX 1050 is relatively out-of-the-world themed desktop more of intergalactic look. It brings to life an alien head look, more like Cybertron and the blue-lit LED face compliments the theme all the more. The side panels are also interesting owing to the tempered glass panels on both flanks. It’s got some of the best parts available crammed into a relatively small package that’s visually dazzling. 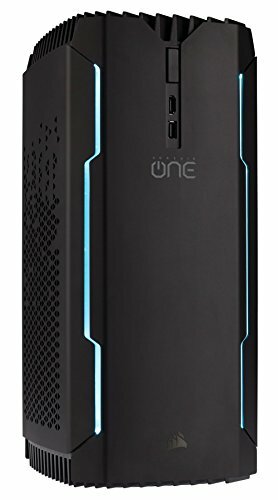 As a follow up to their original Corsair One that was well received in the industry, they’ve upped the ante a bit with some minor upgrades in this iteration. As with the first verision, for it’s size, it’s hard to believe they crammed so much hardware in there which includes two 240mm radiators – each to cool both the CPU and GPU. Add to that a 500W PSU, a not insignificantly sized 1080 GTX Ti, and a 2TB 2.5″ HDD and you begin to realize what a nice job the Corsair engineers did to get to such a small form factor which measures in at a petite 7.87″ x 6.92″ x 14.96″ (200 x 176 x 380 mm) and 16.31 lbs (7.4kg). A big part of the weight comes from the 12L of coolant total across both cooling loops.It was well protected that’s for sure! Of course, you would expect as much given the value of the contents. Namely the video card and the addition of an NVMe M.2 SSD with the latter being the chief gripe with the original One. Rather than opting for a boring rectangular chassis, the front section of the Omen Desktop is angular and reasonably interesting. Most of the front panel’s plastic is textured with a carbon-fibre pattern that looks pretty good, even if it’s not real carbon fibre. There’s a large illuminated Omen logo in the center, along with some red lighting that emanates from the large intake vents below. The Aspire GX gives lag-free computing for finer, more intricate moving images delivered faster. The design of Aspire GX is meant to make a statement of intent as its striking design looks like it means business. With impressive processing and graphics card specs the Aspire GX gives you the power to have lag-free entertainment. Look like you mean business with the striking visual design, sleek lines and angles to make your eyes water. If the two coils are close together charging takes place in inductive mode, if they are separated by an object then resonance mode is used. The stylish design of the Aspire GX is further enhanced by red “V” shaped LED lights. Unleash your gaming dominance with VR Ready NVIDIA® GeForce® GTX 10701 or AMD® Radeon™ 480 graphics card.